While there are several ways a volunteer can work at Music Hall, Ekkehard Böhme takes two routes. 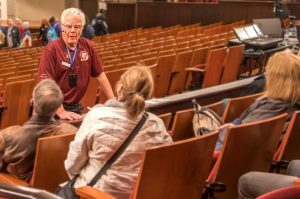 He’s been an usher for four years, and signed up as a guide in 2017, driven by his keen interest in the history of Music Hall. Ekkehard mainly leads tours, and he also spends time in rotation at the Guest Information Desk. His favorite? He likes giving tours the best because of the look on the faces of people when they hear something new about Music Hall. I really enjoy Springer Hall for its glamour and history! When I stand there I think about the millions of patrons that have been in this space! Ekkehard says he retired “many years ago” from the pharmaceutical industry. This gives him time to pursue his passions, which are many, from traveling with his wife, spending time with their grandchildren, attending concerts and sporting events, and he plays tennis and golf. In addition, Ekkehard is a volunteer for the Western & Southern Open tennis tournament and local pro golf tournaments. As his passion for history brought him to Music Hall and SPMH, it also provided the impetus for him to undertake the role of family historian. Ekkehard has created two books. One covers the lives of his parents, who lived in more than a dozen places on two continents. It includes a family tree, dating back to 1785. The other book presents postcards his grandfather wrote to his dad between 1910 and 1919. In this book Ekkehard includes the letters his father wrote to his mother, while he was in a German military camp in Prussia, which is now Poland. Ekkehard looks forward to sharing his family’s history, and Music Hall history, for many years to come!